Each year, faculty in the College of Arts and Sciences are recognized for their contributions to the college, the university, and the impact of their teaching and research at the annual faculty awards dinner. One member of the Department of Geography received an award at this year’s event, which took place Thursday, December 1, 2016. The Excellence in Research/Creative Achievement awards recognize faculty excellence in research and creative achievement at three levels: the early career, midcareer, and senior career. Yingkui (Philip) Li, associate professor of geography, has been a faculty member at UT since 2009, after serving three years at the University of Missouri. Collaborating with scientists from across the globe, Professor Li has developed innovative approaches that use cosmogenic nuclides to investigate glacial chronology and erosion patterns in the Swedish Mountains, Tibet, Central Asia, and Costa Rica highlands—all key indicator areas in the search to understand the pace and geographic dimensions of ongoing global climate change. His integration of rigorous field-based data collection with GIS and complex environmental modelling is noteworthy for advancing paleo-climate study and environmental reconstruction. Li has established an enviable publication record, having (co)authored over 75 articles in high-impact journals, with 25 of those pieces appearing since 2014. His research is supported by the National Science Foundation, EPA, National Natural Science Foundation of China, and Chinese Academy of Sciences. 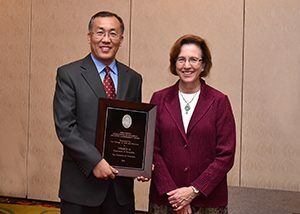 Congratulations to Professor Li for his achievement.